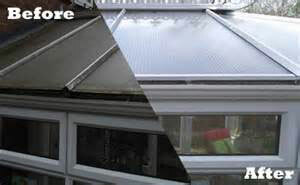 We clean the whole conservatory from the roof down to the frames, all the gutters are cleaned out using our gutter sucker system, all the running outlets and down pipes are checked that they are free flowing of water. We use a special Upvc friendly cleaners for all the plastics including the poly carbonate roof this revives tired looking UPVC. after this is done we rinse the whole conservatory down using our pure water washing system. When the conservatory is dry we treat the UPVC to a cream cleaner and a final polish of the surfaces. This process will bring back that just fitted look to your conservatory. We also offer a full internal conservatory cleaning service, this includes all UPVC surfaces vacuumed all UPVC/poly carbonate surfaces are cleaned and polished, all glass surfaces are also cleaned. We will also check all the locking mechanisms on windows and doors lube and adjust if necessary. We offer different levels of service for conservatory cleaning from outside only to our premier service. To find out more or to get a competitive rate quote call us on 07827 258 782. We offer two types of window cleaning from the traditional cleaning service to the pure water system. 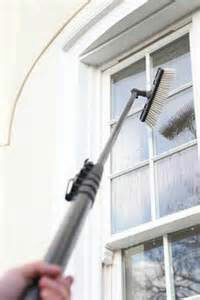 You probably associate window cleaning with a tall ladder, a bucket of soapy water, a squeegee and a cloth. This traditional method still has a firm place within the industry despite the development and widespread use of the Water Fed Pole System. For low level windows, tight access situations and inside window, MW Cleaning services will often employ these traditional methods. Ladders are used where other means of access or water fed poles are not suitable. In some sectors including retail using this conventional technique is still the most cost effective way to clean your windows. This system means window frames and sills can also be cleaned, as well as allowing the windows to be cleaned on the inside, ensuring customers get a complete window cleaning service and spotless results. You may be surprised to know that no chemicals or detergents are used or required. Dirt particles are agitated using a purpose made, soft bristled brush, and rinsed away using extremely pure water. Windows cleaned using this method are left wet which is what seems strange to some. If the windows have been cleaned correctly once the windows dry naturally, you will be in no doubt impressed with the results. The window frames will also be cleaned more thoroughly than using traditional methods. You may notice that the windows seem to stay cleaner for longer. This is because there is no sticky soap residue left on the window. Usually rainfall would mix with this soap residue and form little spots on the windows. After a little while using this method, all traces of the soap residue will be rinsed away. The rain will have no soap residue to mix with and therefore they will likely appear to remain cleaner for longer. Legislation now limits the use of ladders as temporary workstations. The law states that ladders should only be used when all viable safer alternatives have been considered. Water fed pole systems are seen as a safer alternative. This window cleaning method allows cleaners to do the job to a very high standard and can therefore substitute the use of ladders. Accidents do happen and if falling from height can be avoided then it makes good sense. The use of water fed poles as an alternative to ladders where possible to do so, is now seen as the accepted way of cleaning windows in harmony with recent health and safety legislation. Water fed poles are less invasive than ladders and cause less disturbance and potential damage. (Eg. Reduced noise, no dents in your lawn, less likely to damage window sills etc.) 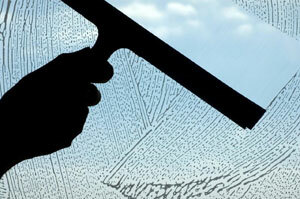 Also, the time it takes to clean the windows is likely to be less than with traditional methods. Something many householders appreciate is that by using water fed poles instead of ladders, there is no more need to worry about the window cleaner suddenly appearing at the bedroom window. No more running around tidying up or rushing to shut the curtains! Window cleaners can now reach with ease previously inaccessible aspects of your property such as third floor windows, conservatory roofs, windows above the conservatory or sloping roofs and other windows that previously had to be left for safety reasons. For a free no obligation quote call: 01480 891375 Huntingdon Branch or 01733 662297 Peterborough Branch or fill in our quick online enquiry form. Cambridgeshire - Lincolnshire - Leicestershire - Leic - The Fens - Fenland - East Anglia. Peterborough - Market Deeping - Bourne - Whittlesey - March - Stamford - Wisbech - Huntingdon - Godmanchester - Rutland - Bourne - Spalding - Boston - Ely - Ramsey - Chatteris - Oundle. Barnack - Baston - Benwick - Brampton - Broughton - Castor - Chatteris - Coates Collyweston - Crowland - Deeping St James - Deeping St Nicolas - Doddington - Easton on the Hill - Eastrea - Elton - Ellington - Eye - Farcet - Folksworth - Fotheringhay - Gedney Hill - Glatton - Glinton - Great Casterton - Great Gidding - Guyhirn - Hampton - Helpston - Holme - Ketton - Knights End - Langtoft - Lolham - Manea - Market Deeping - Maxey - Milton - Nassington - Newborough - Newstead - Northborough - Oundle - Ramsey - Ramsey St Marys - Ryhall - Sawtry - Somersham - Stamford - Stibbington - Stilton - Swingbrow - Tallington - Thorney - Tick Fen - Uffington - Wandsford - Warboys - Warmington - Washingley - Werrington - Wimblington - Wisbech - Wistow - Wittering - Woodnewton - Woodston - Yarwell - Yaxley. © Copyright 2017 MW Cleaning All Rights Reserved.